Volcanic earthquakes and tremors were detected near the end of March by instruments maintained by Hokkaido University. This small island 55 km W of Hokkaido in the Japan Sea consists of two coalescing volcanoes. An eruption in August 1741 produced heavy ashfall on the Hokkaido mainland. A violent explosion and landsliding from the Nishi-yama cone accompanied a large tectonic earthquake and a major tsunami that killed 1,475 people, most on the W coast of the Oshima Peninsula. Subsequent eruptions through early 1742 produced a new central cone and lava flows. Minor explosive activity was documented in 1759, 1786, and 1790. The Global Volcanism Program has no Weekly Reports available for Oshima-Oshima. Oshima-Oshima, a small, 4-km-wide Japan Sea island 55 km west of the SW tip of Hokkaido, is the emergent summit of two coalescing basaltic-to-andesitic stratovolcanoes. Higashiyama, at the east end of the island, is cut by a 2-km-wide caldera covered on its west side by Nishiyama volcano. 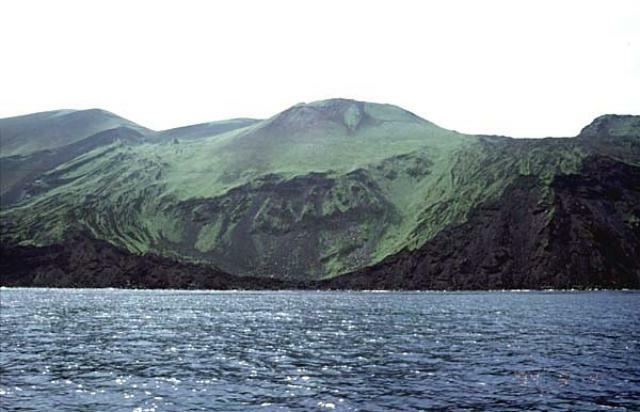 The western cone failed during an eruption in 1741, creating a large horseshoe-shaped caldera breached to the north that extends from the summit down to the sea floor at the base of the volcano and producing a mostly submarine debris avalanche that traveled 16 km. A tsunami associated with the collapse swept the coasts of Hokkaido, western Honshu, and Korea, and caused nearly 1500 fatalities. The 1741 eruption, the largest in historical time at Oshima-Oshima, concluded with the construction of a basaltic pyroclastic cone at the head of the breached caldera. No eruptions have occurred since the late-18th century. Fujitani T, Masuda A, 1982. Wholly compatible and complementary patterns of rare-earth elements in Quaternary volcanic rocks from Oshima-Oshima and Oshima-Kojima isles, Japan. Geochem J, 16: 23-31. Katsui Y, Yamamoto M, 1981. The 1741-1742 activity of Oshima-Oshima volcano, north Japan. Hokkaido Univ Fac Sci J, 19: 527-536. Satake K, Kato Y, 2001. The 1741 Oshima-Oshima eruption: extent and volume of submarine debris avalanche. Geophysical Research Letters, 28: 427-430. There is no Deformation History data available for Oshima-Oshima. There is no Emissions History data available for Oshima-Oshima. Oshima-Oshima volcano is seen here from the north with Kanpo-dake, the pyroclastic cone formed following the 1741 eruption on the center horizon. Major edifice collapse in that year produced a large horseshoe-shaped caldera open to the north, whose walls are visible at the sides of the image. Oshima-Oshima, a small, 4-km-wide Japan Sea island 55 km west of the SW tip of Hokkaido, is the emergent summit of two coalescing stratovolcanoes, Higashi-yama, at the east end of the island, and Nishi-yama at the west end. Copyrighted photo by Tomoyo Hayakawa (Japanese Quaternary Volcanoes database, RIODB, http://riodb02.ibase.aist.go.jp/strata/VOL_JP/EN/index.htm and Geol Surv Japan, AIST, http://www.gsj.jp/). Large Eruptions of Oshima-Oshima Information about large Quaternary eruptions (VEI >= 4) is cataloged in the Large Magnitude Explosive Volcanic Eruptions (LaMEVE) database of the Volcano Global Risk Identification and Analysis Project (VOGRIPA).